A 5-year-old cat that weighs 39 pounds recently checked into Santa Fe, N.M., shelter after his 87-year-old owner could no longer care for the feline. 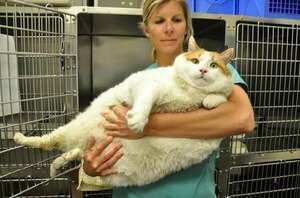 Meow, a 39-pound cat, is held by Dr. Jennifer Steketee at the Santa Fe Animal Shelter. The cat, named Meow, was originally dropped off at a shelter outside Roswell, but the animal was too much for the facility to handle. The cat is currently at a temporary foster home, and seeks a permanent owner. The cat’s weight of 39 pounds roughly translates to 600 human pounds. According to the Gunniess World Records, the world’s heaviest cat weighed 47 pounds. Veterinarians say Meow should weigh 7 to 12 pounds and don’t know what his former owner was feeding him; amazingly enough, he does not have diabetes, which is increasingly common in obese cats. Meow’s weight is causing the cat a host of problems. He gets stuck in cat doors, barely fits in a carrier, hardly plays, can hardly walk, and can’t breathe if he lays down in a certain way. Meow is currently on a high-protein, low-carbohydrate diet, with an initial goal of losing 10 pounds. One caveat is the potential onset of fatty liver syndrome, if the cat loses weight too fast. “Killing with kindness is something we clearly need to avoid,” she said. Meow’s progress can be followed on the Santa Fe Animal Shelter and Humane Society Facebook page.